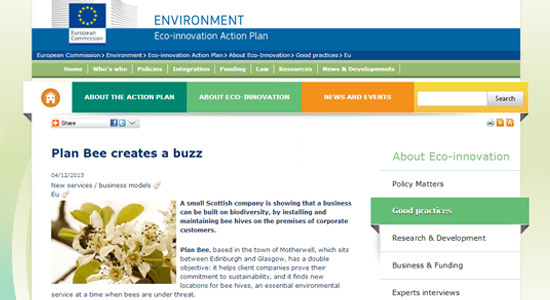 Plan Bee Ltd team is ecstatic to have been selected by the EU Commission for profiling as an exemplar of Eco Innovation initiative. The initiative is one of a number of Flagship Initiatives by the EU Commission building on the Innovation Union and focusing on the specific bottlenecks, challenges and opportunities for achieving environmental objectives through innovation. We are ‘bee’sides ourselves for being one of the first to market in this unique Flagship initiative. During Christmas we are encouraged to deck the halls with boughs of uninspiring manifestations of our love for one another. These are often wasteful and useless imports from China that no one has ever wanted, and nor will they ever want. So why not ‘Bee-Inspired’? We have a wide range of award winning Scottish artisan honey that is produced in our hives throughout the country. The honey is minimally filtered and unpasteurised, which ensures that it contains all the associated natural health benefits. Take a peek inside our gift guide see our unique ideas for customisable personal gifts that champion biodiversity. Help the bees, help biodiversity and stop carbon Christmas from consuming itself. Have a look at our Christmas catalogue! Merry Christmas and Have an Environmentally Friendly New Year! For ordering, please download our Plan Bee Ltd Order Form and send it back to buzz@planbeeltd.com. Please don’t hesitate to contact us if you have any questions regarding our products!